Public administration, and especially national and local government, have been central to sports centre development over the past six decades. They remain so today as we head towards the third decade of the 21st century. Notwithstanding the early presence of a small number of trusts, most centres have been and still are owned by local authorities, and until the 1990s were operated by them directly. Such has been the importance of local government to sports centres, swimming pools and sports development that the re-organisation of its local structures and governance at various times over a period of fifty years has been a very significant influence and context. This is no surprise as far as sports centres are concerned, as the very large capital and revenue costs of such buildings were far more suited to public sector finances. Understanding the nature, context and evolution of UK local government is a crucial part of the history of the sports centre. Sport and recreation have never been statutory functions for local government and therefore in many ways it is even more remarkable that the growth largely occurred through the medium of Borough and District Councils. This is apart from the involvement of County Councils as education authorities in joint provision centres, as counties were rarely direct providers in England and Wales. This is especially so as the reality is that non-statutory services (the “discretionary block” in local government finance) are always the most vulnerable to financial pressures. All recreation management bodies over the years have tried to persuade Government to make ‘sport and leisure’ a statutory function, but without success. From the 1960s there were several re-organisations of local government that sought to achieve better-managed and better-financed authorities for different areas. In the early 1960s the UK was largely covered by administrations based on counties and a mixture of second tier authorities of municipal boroughs and rural and urban districts, plus a further sub-structure of town and parish councils. In the late 1960s and early 1970s it was often local pressure from the towns and parishes that contributed to the decisions on centre provision and locations. There were also county boroughs, which were autonomous single tier authorities, outside the County Council structure. As we have seen, all these various types of Council were involved in some of the very first centres, ranging from the councils of Castle Ward District and Ponteland Parish, to Stockton Borough and Easthampstead Rural. The London Government Act 1963, implemented in 1965, had officially recognised the conurbation known as Greater London and created a new local government structure for the capital. The Act significantly reduced the number of local government districts in the area, resulting in London Boroughs being responsible for larger areas and consequently populations. The upper tier of local government covered the whole of the Greater London area with a more strategic role, and the large boroughs became the lower tier of the system. This in itself had a bearing on the provision and location of sports centres and, more particularly, swimming pools. The establishment of the new County Borough of Teesside in April 1968 abolished or reduced ten former authorities. This was a pathfinder in local authority reorganisation outside London. It was particularly relevant to the early Teesside sports centres. Some of these sports centres had been provided before Teesside Borough and all well before the re-organisation of local government nationally had been conceived. The new Teesside Borough established a major committee and matching department for the arts and recreation. The new department, headed by a chief officer, spanned services covering the arts, libraries, museums and art galleries, entertainments, sport and physical recreation, baths, parks, and catering. This was a model which would be later adopted by many larger scale authorities, for example, Thamesdown in Wiltshire. From the 1960s, the essential, over-riding justification for the provision of sports centres was rooted in the general post-war social and political context. This was linked to the important recognition that, to develop, sport required indoor facilities, especially having regard for UK weather. All of this was supported and strengthened by the various important reports up to 1974 which encouraged indoor provision. However, from 1974 a new impetus was to have a major impact. This impetus was driven by the Government’s reorganisation of local authorities outside London in 1974. There had been post-war pressure to modernise local government. However local government re-organisation in England and Wales in April 1974, outside London, was not initiated until the publication of the Redcliffe-Maud Report which was the outcome of the Royal Commission on Local Government in England from 1966 to 1969, and held under the chairmanship of Lord Redcliffe-Maud. Broadly the report recommended the abolition of all the existing county, county borough, borough, urban district and rural district councils, which had been created at the end of the 19th century, replacing them with new unitary authorities. Simultaneously Commissions reported on Scotland and Wales. However, when the Conservatives won the 1970 general election, they did so on a manifesto committed to a two-tier system across local government. In 1971 a further White Paper entitled “Local Government in England: Government Proposals for Re-organisation” announced its intentions, and this led to the 1974 re-organisation. The Bains Report for England and Wales in 1972 had, in effect, completed the ‘plan’. It had reviewed the role, structure, governance, and management for these new local authorities. In summary, in 1974 the 1400 previous English and Welsh District Councils outside London were considerably reduced. In England, there were 45 counties and 332 districts created, and in Wales 37 districts within 8 counties. Six of the English counties were designated as metropolitan counties. The new English counties were largely based on the traditional ones, albeit with substantial boundary changes. The 13 historic counties of Wales, however, were abandoned entirely for administrative purposes, and 8 new ones instituted (Clwyd, Dyfed, Gwent, Gwynedd, Mid Glamorgan, Powys, South Glamorgan, and West Glamorgan). The structure introduced meant revised (and in many cases larger) counties in more rural areas, which provided the top tier of local government, with non-metropolitan boroughs and districts as the second tier. In heavily urbanised areas six of the English Counties became metropolitan counties, with the subdivisions called metropolitan districts. Scotland had a similar structure to England and Wales introduced in 1975 following the Patterson Report. This significantly reduced the number of Scottish local councils down from 425 to a more manageable 12 Regions and Island Areas and 53 Districts within a 2-tier structure. Northern Ireland, however, had had its entire two-tier system replaced in 1973 by a single-tier district and borough council system comprising 26 Districts. Here the role of the District Councils was slightly different in that the re-organisation placed a duty on Councils in the Province to “secure the provision, for its area, of adequate facilities for recreation, social, physical and cultural activities”. These re-organisations were the biggest ever set of changes made to local government and were to prove to have a very big impact on the development of sports centres. It was in the District Councils of England, Wales, and Scotland where the greatest effect on recreation provision was felt as these councils took the lead on this issue. The only difference in Scotland was that the upper-tier was known as Regions and Islands and there was in effect a two-tier structure for recreation, with districts providing and managing community sports facilities, whilst regional councils owned and managed all school-based community facilities. The emphasis of the Bains Report for England and Wales, and the broader scale and range of facilities within these larger councils, led to structural changes and the widespread establishment of new broad-based recreation and leisure departments. These departments often embraced sport, arts, entertainment, parks, and other community facilities. This was also the case in Scotland, where, for example, between 1973 and 1976, 84% of all local authorities created leisure and recreation departments. Across the UK his created many opportunities for chief recreation officer posts and other similar roles. This attracted the interest, and appointment, of many sports centre managers with knowledge of these relatively new sports buildings, at a time when many of these new councils had no previous experience of them. The rapid movement and successive promotion of recreation management staff across the country over the next five years was thus considerable, as with the other public-sector professions, as posts were created and advertised nationally. These organisational changes also contributed significantly to a surge in sports centre developments, and indeed the growth of recreation management generally. However, structural changes continued to influence local authority activity, including sport and recreation management, as the situation of wholly two-tier government did not last. The county councils for the metropolitan counties were abolished in 1986 by Margaret Thatcher’s government, making the metropolitan boroughs into unitary authorities. A further set of reforms in the 1990s led to the re-establishment of many old county boroughs as unitary authorities, along with other areas. Later, other changes were also to impact on local authority structures and recreation management. In 1986 the Greater London Council and the six metropolitan County Councils were abolished, leaving the boroughs to operate as single-tier units, although the abolished larger areas were still recognised for some purposes such as statistical presentation. Additionally, there remains significant joint working at a ‘County’ scale (e.g. Greater Manchester Police, Greater Manchester Fire & Rescue, etc.). There was another major re-organisation in England, Scotland, and Wales in 1994, which was implemented incrementally from 1994-1996. This led to the creation of ‘Unitary’ authorities in many parts of the country (‘Unitary’ Councils and ‘Cities’ in Scotland; ‘Counties’, ‘County Boroughs’ and ‘Cities’ in Wales). In some areas, this too had a significant impact on centres. However, the financial impact on any new centres planned was not as great as in 1974, as the Government drafted the regulations specifically to prohibit the use of reserves and balances for capital works. Unitary councils tended to rationalise or reduce services, and in many cases leisure & recreation departments, formed during the 1974 re-organisation, both in Unitary Councils and in the remaining Districts, started to slowly disappear after this time. More recently, reform of local government in Northern Ireland saw the replacement of the twenty-six districts created in 1973 with eleven ‘super districts’ in April 2015. The review process had originally begun in 2002, with proposals for either seven or eleven districts made before it was suspended in 2010. Apart from the immediate effect of these significant structural changes on sports centre developments and recreation management, the geographical structures resulting from these changes have continued to influence local government’s role in sport & leisure in the 21st century. This is especially true of sports centres built in the 1970s and 1980s. Much later, the suitability of the locations of those sports centres in those ‘new’ councils would be reconsidered. Some boundaries and/or catchments changed in the subsequent years, and difficult decisions would face local authorities over refurbishment, replacement, and location come the turn of the century. As can be seen above, and from the numbers and the centres recorded below, the 1974 Local Government reorganisation had a significant impact on the provision of sports centres; but it is interesting to examine why this specific sector of the cultural portfolio benefited where others did not? For example libraries which had been a statutory function of local authorities since 1850 and museums, encouraged since 1845, did not see such a huge growth or redevelopment in this period. The need for “legacy” – many of the changes were meant to be amalgamations of authorities, but many Councils felt they were being ‘taken over’ and absorbed into larger authorities thus losing their identity and heritage. Consequently, a large number, especially in England, took the opportunity to use their reserves and balances to leave a legacy for their area in the form of a ‘new’ sports centre as a lasting memento of their former existence for the benefit of their local communities. Novelty – centres were a new and “fashionable” form of provision. The positive impact of the early centres. Many local authorities sent delegations to visit the early trailblazer centres, were impressed by the positive impact they were having on their local communities, and wished to replicate this in their own areas. The advocacy of the Sports Council and in particular the Regional Sports Councils which had well developed networks of influential local authority members and were therefore well placed to influence decision makers. The growing professionalism of the recreation management profession whose early members often went on to senior positions of influence within new recreation departments. Political influence – as mentioned in Chapters I & 2 the Wilson Government saw sport as a component of the Welfare State and believed it had a resonance with their core constituency. The “Copy-Cat Effect” – at its most base level it is probable that the ‘me too’ factors of seeing provision being made elsewhere and in neighbouring areas influenced many decisions taken at this time. While each decision was taken locally for reasons which at this remove can only be guessed at, it is likely that one or a mixture of these factors played a part in the surge in provision of sports centres as opposed to other forms of leisure provision. Some centres had been developed well before re-organisation came to bear and were inherited by the new 1974 authorities. 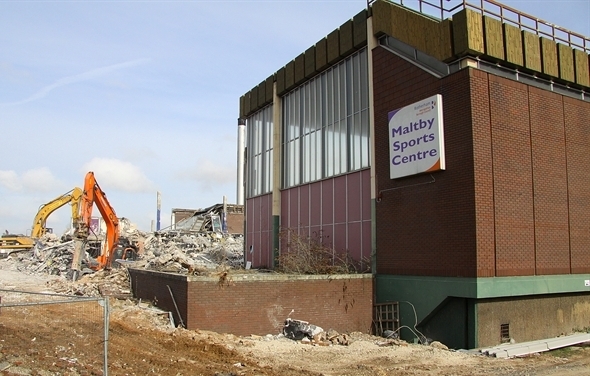 For example, the original Maltby Sports Centre, opened in 1972, was the last major project of West Riding County Council. Rotherham Borough Council inherited the centre in 1974. The scale of ‘disappearing’ councils in England and Wales, and then Scotland, had a huge impact on sports centre provision. Whilst some projects in England and Wales were committed and opened just prior to or during 1974, others underway before 1974 were not completed until 1975 or later. It was left to the new councils to pick up the capital and/or revenue bills for these major schemes. The organisational changes in Scotland had a similar impact on the expansion of centres, whilst later, in Northern Ireland, ‘the troubles’ of the late 1960s and 1970s were to have a much greater impact than re-organisation. The overall recording methods across the regions for the numbers of a) sports centres; b) sports halls and c) public access to them, was very complex, and often confusing (see Chapter 4 – the number of centres). 27 sports centres (as defined – including conversions) had been opened by 1972 (ref. ‘Provision for Sport’ 1972). 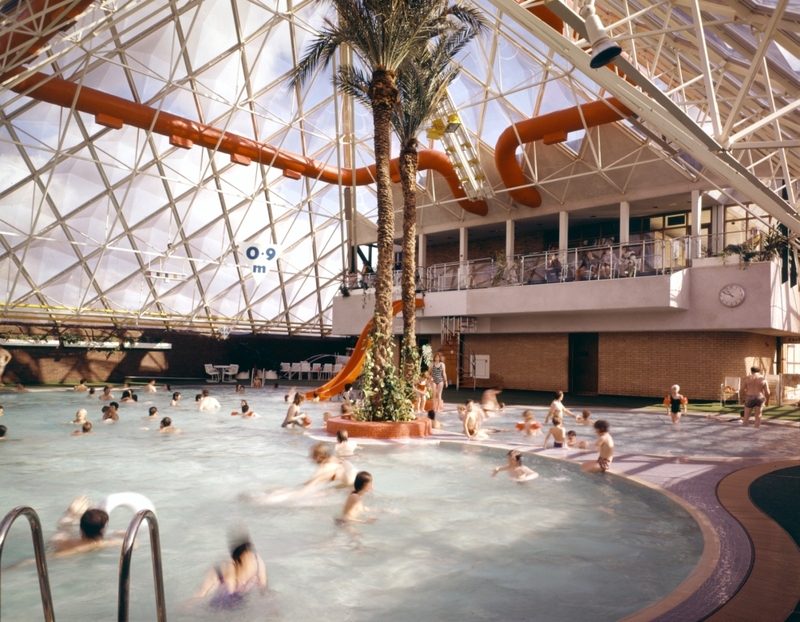 In the two years of 1974 and 1975 approximately 150 centres were opened across the UK – c.90 in 1974 and a further – c.60 in 1975 (reference ‘The British Leisure Centre Guide 1993’). This two-year boost had taken the UK to a total of over 250 centres by 1976. In his 1974 presentation at a Nottingham seminar, Ron Pickering had referred to ‘300 buildings’ being achieved by January 1974. This referred not just to community indoor sports centres, including those jointly provided, but also the number of free standing sports halls developed on education campuses. Sport England (reference Sports Hall Design 2012) records 453 sports halls opened between 1971 and 1975, reflecting not only the growth of indoor sports centres, but the progress in the provision of sports halls on school sites, including those not initially intended for public use. The centres opened in 1974 and 1975 were distributed right across England Scotland and Wales as the need, message and desire for centres spread. Notable openings by borough and district councils in England and Wales in 1974 included major centres in Harrow, Hemel Hempstead, Scarborough, St Austell, Redruth, Killingworth, Whitehaven, Kirkby, Grimsby, Lincoln, Haltemprice, Tewkesbury, Bridgend, and Pontypool. Significant 1975 openings included, Stretford, Altrincham, Grimsby, Stevenage, Orpington, Slough, and Cambridge. These centres were largely developed in towns of some substance. There were also a significant number of jointly provided centres opened in 1974 and 1975 as the advocacy for the economic sense of jointly provided centres, largely on school sites, came to bear. The emphasis for joint provision, at this time, as we see in Chapter 5, was for centres in less heavily populated and more rural areas of the country. Changes in Scotland had a similar impact on the expansion of centres in Scotland where centres opened in 1974 included Dingwall, Glasgow, East Kilbride, Lochside and Forfar. Progress was much slower in Northern Ireland, not least because of the political and social troubles at that time. Whilst Antrim Forum had opened in 1972 and the Brownlow Centre in Craigavon in 1974, the real expansion in Northern Ireland was to come later in the 1970s, and in the 1980s partly as a Government-led response to ‘the troubles’. 1974 and 1975 also provided a foretaste of developments to come, with the arrival of the Herringthorpe Leisure Centre, Rotherham, and the Bletchley Leisure Centre. Both broke free from the traditional rectangular swimming pool, providing free-form ‘leisure’ fun-pools and signalling the arrival of the ‘sports and leisure centre’. The sports hall however remained a key element in the facility mix of both. The surge of centres in 1974 and 1975 was undoubtedly rooted in the re-organisation process and the other likely explanations we have set out for these preferred investments. For the same reasons, many of the new councils set about new centre schemes that were to materialise later, as we will see. The protagonists for indoor sports provision, Munrow, Molyneux, Howell et al, who helped drive the case in the early 1960s for the provision of purpose-designed and built indoor sports facilities, were the seers and prophets of the time. They sensed the way the wind was blowing and were eloquent and innovative in their efforts to divine the best way forward. In the late 1960s and early 1970s the pioneers of sports centre development and management followed the protagonists. The pioneers were primarily the sports administrators, architects, centre managers, politicians and organisations that provided vision to, and implemented, the projects that shaped the future. The pioneers, the founding fathers of sports centre development and management, can be divided into two groups. Firstly, there were those who did not actually manage a facility, but played a significant executive, advocacy or supporting role. Secondly there were the first centre managers. To the fore amongst the first group, for example, were Harry Littlewood and John Birch of the CCPR and then the Sports Council, and Len White, who was instrumental to the Harlow centre’s establishment. This group included the architects, in both the private and public sector, who took on the challenge of developing the first sports halls and multi-purpose centres. These new types of civic building were as much a challenge (and opportunity) to architects as the management of them. Planners, too, were instrumental in putting the national vision into local places. In addition, there was also Ted Blake, Managing Director of Nissen Trampoline Co Ltd who financed the first Recreation Management Conference and became a long-term friend of the recreation profession. An important leadership role was played by the chairmen of the early trusts, including Sir Arthur Noble at Harlow and Norman Booth MBE at Redbridge. Key politicians at national and local level were also influential. At national level, there was no one more prominent than Denis Howell. The chairmen of the new local council recreation and leisure committees from 1974 were vital in piloting council members through these new waters. At local level from the 1960s there was a great example of a supporter of sport and centres in Bernard Atha CBE, a legendary councillor in Leeds for 57 years, a Chairman of Leeds Leisure Committee and a Vice-Chairman of the Sports Council. As a member of the Regional Sports Council he supported sport across Yorkshire & Humberside and helped Denis Howell set up the original Sports Aid Foundation (SAF). Bernard retired from his trusteeship of SAF in 2017 at the age of 90. He was also a well-known TV and film actor! Amongst the pioneers on the architectural front were the architects of Harlow Sportscentre’s first stage, Frederick Gibbard & Partners, and Perrin Associates, who designed all subsequent stages. Gerry Perrin was one of the first architects to make his name through sports centres which included not only Harlow, but Dunstable Park, Folkestone and Redbridge. He was also the author of the substantial architectural overview of sports facilities, ‘Design for Sport’, published by Butterworth in 1981. Other pioneering architects were Williamson, Faulkner Brown & Partners (for the Lightfoot Centre, Huddersfield Sports Centre, Beau Sejour Leisure Centre, St. Andrew’s University, et al); Robert Mathew, Johnson-Marshall & Partners (Meadowbank); and Arthur Gomez, who was responsible for several centres in Surrey including Farnham Sports Centre. The plans of Farnham were later sold for £45,000 to Surrey Heath Council to build the Arena Centre, Camberley! Public sector architects, those in local authorities and development corporations, also played a role at this time. The first lessons had been learnt in terms of facility design and operation, but there was still a long way to go. The second group of pioneers were the first managers of centres and included George Torkildsen, Graham Jenkins, Bernard Warden, Geoff Bott, John Williams, Ian Douglas, Griff Jones, Bill Leadbetter and Geoff Gearing. The group also included Ron Pickering who was a qualified PE teacher and became Recreation Manager at the Picketts Lock Centre. Ron had been a well-known national athletics coach, and later a partner in consultancy with George Torkildsen. He was also a popular TV sports commentator for thirty years. The efforts of these early pioneers, and many, many others, were to bear fruit for decades to come in terms of both centre management and the development of the new recreation management profession. With so many centres, major opportunities were being created for centre management positions. The developments had created a demand for a new breed of centre manager. In the absence of specific qualifications and established career structures, the recruitment of sports centre managers was undertaken from a wide variety of sources. A feature of managers of the early centres was their diverse backgrounds. Some managers did come from other backgrounds, including some with successful sporting careers. One of the more well-known examples was the appointment of David Hemery CBE, 1968 Mexico Olympics athletic gold medallist, as Director of the Sobell Centre. Looking back, it was a ‘bonanza’ time for management opportunities. Managers were usually wisely appointed in advance of new centres opening, but with the occasional building delay, some were moving on to seemingly better centre management posts before their existing centre had opened its doors to the public! The burst of new posts and appointments was not confined to sports centres. Local government re-organisation in 1974, and the emphasis on corporate management, led to many enlarged Borough and District authorities creating new recreation departments. These departments embraced various facets of recreation and leisure, often including parks and entertainment, even cemeteries sometimes! One council, Restormel in the west country became known as the A-Z authority, as it had an airport and a zoo within its purview, though not all within the recreation department! Most Councils appointed Directors of Recreation, or at least Recreation Officers, to oversee this broadening sphere of activity. For example, the Eastern Region of the Sports Council reported that by 1981 31 of 48 Districts had appointed Recreation Officers, and a smaller number had fully fledged Departments. Such posts were not entirely new as exemplified by some of the earliest ‘pathfinder’ appointments. John Pinches was appointed as Director of Arts and Recreation for the newly created County Borough of Teesside in 1968 (John was related to, but not the John Pinches who was an early assistant to George Torkildsen at Harlow!). In London, Spencer Hudson and Chris Field were appointed as directors of recreation in the Boroughs of Islington (1969/70) and Greenwich (1971) respectively. Chris Field, originally ex-forces, had been the first Director of Carlton Forum. 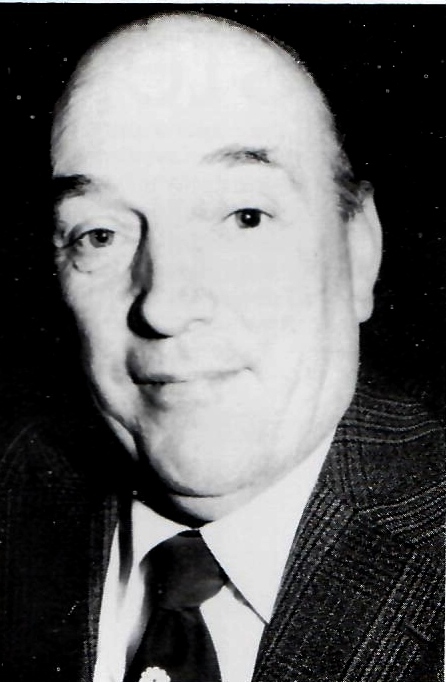 Also in 1971, Denis Molyneux was appointed from the Sports Council to be Director of Leisure Activities and Recreation at Luton Borough Council. Where a council already had, or was planning, a new sports centre, some of these new departmental posts went to sports centre managers who had the experience to deal with these new buildings, which were often at the heart of the new departments’ activities – and costs. However, overall these posts were filled by personnel with a very wide range of backgrounds. Inevitably, with the musical chairs for posts resulting from re-organisation, there were a quite a number of post that went to existing senior officers from other disciplines. Some such appointments were very successful, bringing into the recreation sector some extremely talented individuals from other backgrounds. Two very good examples were Alec Collins and John Birch. Alec was appointed as Director of Leisure at Macclesfield District having previously been Clerk to a small Urban District in the area. Alec went on to be Chairman of the Association of Recreation Managers (ARM), and after amalgamation of the various professional bodies in 1983, became President of the Institute of Leisure & Amenity Management (ILAM). John Birch was appointed for 5 years from the Sports Council to become Chief Leisure Officer for Waverley DC in 1974. He provided reverse value, bringing local government experience back to the Sports Council on his return as Director of the Regional Services in 1979. This was particularly important because of the increasing influence the Sports Council was having on local government activity. Some local government managers continued in their previous senior positions, not always comfortably when sports centres extended their responsibilities beyond baths, parks, or entertainment. Others thrived with their new budgets and prestigious new facilities, and yet previous functions still to be performed. There was still a need for the horticultural and other expertise that resided in local councils. One of the critical questions is whether the advent of centres and recreation management had at least a temporary, detrimental effect on these established functions and their public benefits. The challenge for the new profession was to ensure that a wider range of leisure services was not neglected but would flourish as Government intended. Needless to say, whilst there were successes, such as Alec Collins, there were also some less successful director appointments (both from sports centres and other disciplines)! Sports centres fell within the normal procedural structures of local government and subject to controlling and opposing political parties, council committees, agendas, reports, minutes and so. Thus, for better or worse, leisure and recreation management became directly integrated into the existing administrative and professional structures. At this early stage of centres, the advice available to a council with a new centre from someone with centre management experience was vital, as council members only slowly developed their understanding and policy approach. On the other hand, many centre managers and directors who were new to local government did find council systems and procedures quite an adjustment. Managers could find themselves subject to the conflicting needs of customers and politicians, but generally, at this early stage of new centres, the political commitment to them and their net operating costs, was, at least publicly, rarely strongly challenged. However, the cost of operating and maintaining these centres was certainly an issue that was going to loom much larger in the future, once the initial euphoria subsided. The re-organisation of local government and the roles of the CCPR & Sports Council were the greatest influences on the provision of sports centres up until 1975. In terms of the development of recreation management, the formation of the Association of Recreation Managers [ARM] in 1969 was an important milestone. In ‘World Cup’ year, 1966, and with only 6 new public centres built (including Crystal Palace NSC), the CCPR had convened a gathering of those involved in those centres and centres being planned, and a wider audience from the gathering interest. 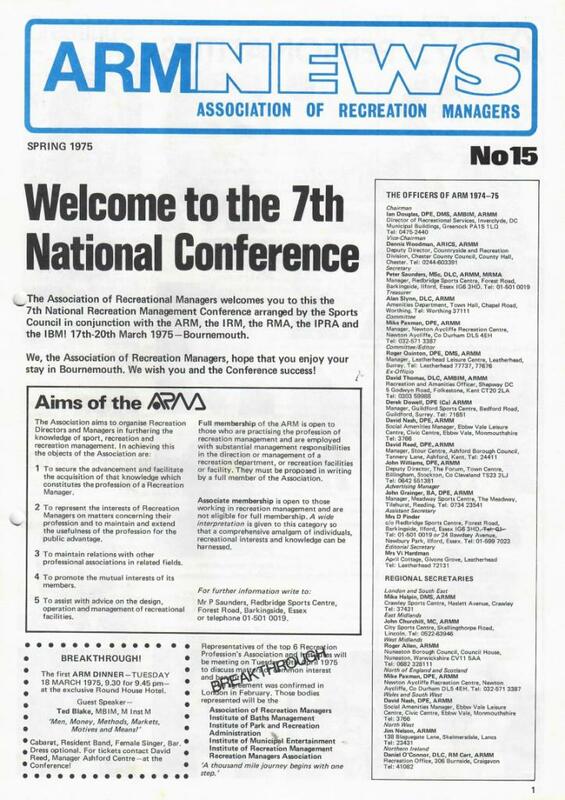 This led to a series of informal meetings of managers and prospective managers from the developing range of centres and in 1969 the Association of Recreation Managers was formed with 25 members at the first ARM Seminar at Afan Lido. The Association was then formally constituted in February 1970. This development proved to be a landmark for the recreation management profession. The Institute of Baths Management, formed in 1921 as the Association of Baths Superintendents, was a pre-dominant management organisation given its membership across the hundreds and hundreds of UK swimming pools. Subsequently it reflected the changing scene, becoming the Institute of Baths & Recreation Management (IBRM). The Institute of Parks and Recreation Administration (IPRA), founded in 1926, representing a very large caucus of parks, grounds maintenance and horticultural staff. The Recreation Managers Association, founded in 1956 as the Industrial Sports Clubs Secretaries Association. The Institute of Municipal Entertainment, formed in 1947 as the Institute of Entertainment Managers, which had a significant membership presence in seaside resort councils, especially those with theatres and entertainment centres. The Association of Playing Field Officers, founded in 1958. The membership spanned playing field officers in education authorities. Other related professional organisation at that time included the Institute of Municipal Catering. It was a natural progression for managers to meet and discuss emerging ‘best practice’ and view newly built facilities. At the outset membership was focused on centre personnel and the only criterion for membership was that the applicant was employed in a management post in a sports centre. ARM attracted nearly all centre managers and assistant managers into its ranks. It quickly broadened its sphere of influence, catering for chief officers, recreation officers within local authorities, managers of swimming pools, trainee manager and students. Membership was of three types (full, associate and student) and was dependent upon the position of responsibility held. The growth in its membership was phenomenal, moving from the first 25 members in 1969/70 to 123 in 1972, 705 in 1977, and reaching over 1,000 by 1982, reflecting the growth of centres and recreation management. The rapid expansion was also reflected in eleven very active regional branches, based on Sports Council Regions, but combining North East England with Scotland. These provided regular meetings on topics of common interest and enabled the practising recreation manager to exchange views and discuss problems with fellow managers. At that time, the originality of the sports centre concept and a desire for knowledge meant extremely well attended events, often visiting new facilities. From the mid-1970s the high rate of growth of the sector meant that ARM could exploit, with the help of John Turner & Associates, commercial opportunities such as events, seminars, exhibitions, annual dinners, and a weekly mailing service. The mailing service was one of the key benefits of membership for ambitious members as many posts were advertised through it, and it was a valuable source of income to the Association. Compared with today’s technology such a service must seem ‘Jurassic’! The weekly brown envelope came through the post with the details of at least a dozen new job vacancies, as well information sheets. The Association also published a vibrant quarterly magazine, ARM News, the archive of which represents a veritable treasure trove of practical centre management information of the time. 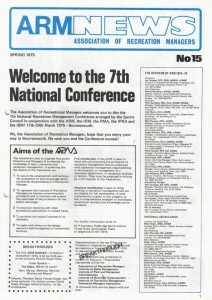 The Association made its mark early with the government. In March 1972, the Association’s Chairman, Vice Chairman, Secretary, and Treasurer were invited to meet Mr. Eldon Griffiths, Junior Minister for Environment and Sport at the Department of in Marsham Street, London. 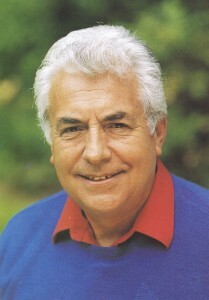 Denis Howell, P.C., M.P., the first Minister of State for Sport and Recreation, was guest of honour and speaker at the ARM Annual Dinner in April 1977 in West Bromwich. One of the most significant commercial supporters of ARM activity was Ted Blake, who in addition to promoting his sports equipment company, Nissen, was passionate about raising the standards of management in the sector. Bernard Warden South East cont. Later, in 1983, ARM was to merge with other professional institutes to form the Institute of Leisure and Amenity Management, which then became ISPAL, and in the 21st century, the Chartered Institute for the Management of Sport & Physical Activity (CIMSPA). A more immediate effect of the White Paper was its proposal for Regional Councils for Sport and Recreation (RCSR) to replace Regional Sports Councils. These accelerated the understanding of recreational issues, and sought to include a greater emphasis on outdoor and countryside recreation. They also developed awareness of projects elsewhere and access to and support of a wide network, plus for some, considerable authority from membership. Whilst the Sports Council was working hard to achieve its 800 centres by 1981, such was the progress in making the case for sports centres that the argument in their favour was already strong and did not figure prominently in the White Paper. The RCSRs therefore embraced a wide range of organisations and people but for sports centres they were probably a significant aid to LA (and LEA) members. The White Paper did highlight the need for comprehensive strategic planning (which came later with regional recreation strategies) and identified “areas of special need” (inner urban areas which have suffered from environmental deprivation and have lagged behind particularly in recreation provision)”. It referred to such priority areas being defined and given special financial assistance for recreational projects. The Sports Council’s advocacy for facility provision was generally enhanced by the introduction of the RCSRs. The nine regional organisations in England did create a ready-made network through which the Sports Council regional teams could promote national Sports Council policies and strategies with a focus on widening the spread of indoor sports facilities for public use. Some RCSRs were more effective in this than others. To further this process the Sports Council used its grant resources, often as pump primers, in consultation with the RCSRs to extend the spread of public indoor sports centres and swimming pools into the gaps across the English regions. Under their terms of reference, the RCSRs were required to produce their own regional strategies, which, although taking different shapes to reflect the character of regions, began to help accelerate the provision of new indoor sports facilities, particularly across England. The concept of sports centre provision had been set by the very first centres from 1964-71, and the new wave of centres from 1972 to 1975 had set the wider pattern for the future, largely within local government. Although there were still variations in local authority structures, activity in this period up to 1975 meant that the provision of sport & leisure centres had started to create the need for, and given substance to, new professional and administrative structures for leisure services. Although these included previous local government functions dating back a hundred years, the new concept of community sports centres had attracted a new generation of people to manage both facilities and departments. This succession of management and leadership had been accelerated not just by the innovative spread of centres, but by the wholesale restructuring and re-staffing of local government into the new authorities. Apart from the considerable strategic work and advocacy of the Sports Council (and the Regional Councils for Sport and Recreation), no other single influence had a greater impact on the numerical development of sports centres than local government re-organisation in 1974. The period to 1975 had provided confirmation of the value of the sports centre and a foretaste of the coming decades. The next 15 years or so was to be an era of further rapid progress in facility design, provision, and management, as a shift in emphasis from ‘sports and recreation centre’ to ‘sports & leisure centre’ took place.